DEAU is a cognac producer with a rich history spanning several generations of the Bru Legaret family. Despite such a rich history its eaux-de-vie was mostly used by other cognac houses in France until quite recently, but nowadays the Bru Legaret family produce cognac under their own brand: DEAU, in honour of Louis Deau who settled in the Cognac region of France during the reign of Louis XIV. Malt Mileage has been extremely lucky to secure cognacs comprising the DEAU Cognac range, including the DEAU VS, VSOP, Napoléon, XO, Black and Louis Memory. In this post Malt Mileage reviews the DEAU Napoléon Cognac. A Napoléon cognac is one that is aged in oak barrels for least six years, which means that it is aged for the same minimum time as an XO cognac. They are usually marketed however as the middle ground between a VSOP and XO Cognac. The DEAU Napoléon Cognac is taken from eaux-de-vie grown in the first crus of the Cognac region, Grande Champagne, Petite Champagne, Fins Bois and Bons Bois. This means that it is a blend of cognacs produced from grapes that are grown in these different parts of the Cognac region, so the distiller appears to be aiming for its own unique product that does not too heavily rely on the traits associated with eau-de-vie from a particular region. The bouquet is quite rich and presents with the aromas of dried fruit, raspberry candy, spice, licorice and the vegetal burn of wasabi peas. On the palate the cognac has a smooth entry and bursts with rich dried fruit, licorice, blackberries and the brightening glow of mint with undercurrents of something lush and vegetal. On the finish the underlying fruitiness of the eaux-de-vie recedes, giving way to cherry liquor dark chocolate and transparent oak tannins that gently dry the palate. 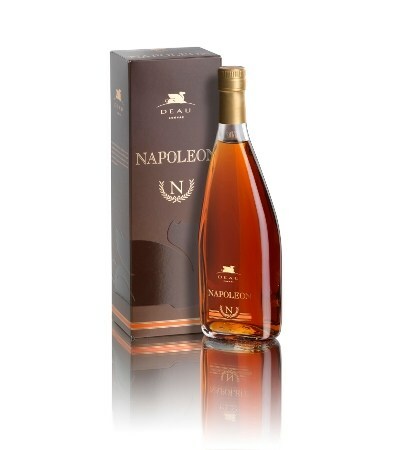 Overall, DEAU Napoléon Cognac is a dangerously drinkable cognac that is vibrant, fruity, sweet and sensationally smooth with a balance that seems to err towards the eaux-de-vie over the oak. It is a cognac that I particularly enjoy sipping while being fixated on my favourite show, because it is extremely “more-ish”, flavoursome and yet simple. This entry was posted in Cognac and tagged Cognac, Napoléon. Bookmark the permalink.